Her brother Todd Fisher said she is receiving excellent care, but that he could not classify her condition. CARRIE FISHER IS is being treated in an intensive care unit in LA after having a heart attack on a flight yesterday. The actor is beloved by legions of Star Wars fans since first appearing as Princess Leia Organa almost 40 years ago. 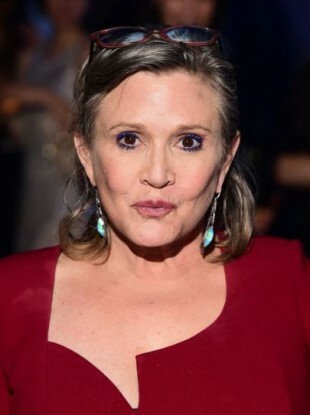 Her brother Todd Fisher told the Associated Press last night his sister is receiving excellent care, but said that he could not classify her condition. He had earlier told the AP she had been stabilised and was out of the emergency room. Fisher (60) experienced medical trouble during a flight from London and was treated by paramedics immediately after the plane landed in Los Angeles, according to reports citing unnamed sources. Fisher’s publicists and representatives for her mother, Debbie Reynolds, and her daughter, Billie Lourd, did not immediately reply to requests for comment. Los Angeles Fire Department spokesman Erik Scott said paramedics administered advanced life-saving care to a patient at Los Angeles International Airport yesterday and transported the person to a nearby hospital. He did not identify the patient. A large gathering of reporters camped outside Ronald Reagan UCLA Medical Center in Los Angeles hospital, where TMZ and the Los Angeles Times reported she had been taken. Catapulted to stardom when the original Star Wars was released in 1977, Fisher reprised the role as the leader of a galactic rebellion in three sequels, including last year’s Star Wars: The Force Awakens. She may be best known for her portrayal of Leia, but she is also an accomplished writer known for no-holds-barred accounts of her struggles with addiction and mental illness. Her thinly veiled autobiography Postcards from the Edge was adapted into a 1987 film version starring Shirley MacLaine and Meryl Streep. She also transformed her one-woman show Wishful Drinking, which played on Broadway and was filmed for HBO, into a book. Most recently, Fisher has been promoting her latest book, The Princess Diarist” in which she revealed she and co-star Harrison Ford had an affair on the set of Star Wars. Email “Carrie Fisher in intensive care after 'heart attack on flight' ”. Feedback on “Carrie Fisher in intensive care after 'heart attack on flight' ”.